Michael J. Fox strums the guitar while performing on stage at the A Funny Thing Happened On The Way To Cure Parkinson’s benefit show on Saturday (November 10) in New York City. Also taking the stage that night were Jim Gaffigan, Willie Geist, and John Mulaney, who all performed comedy routines. 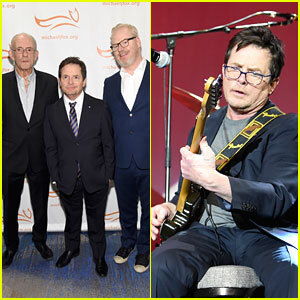 Katie Couric and her husband John Molner, Jennifer Grey and Clark Gregg, as well as Michael‘s Back To The Future co-star Christopher Lloyd were also in attendance. 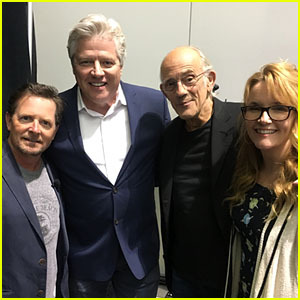 'Back To The Future' Cast Reunites at Fan Expo in Boston! The original Back To The Future cast is back together again! Michael J. Fox, Christopher Lloyd, Lea Thompson and Thomas Wilson all posed for a picture together on Friday (August 10) at the 2018 Fan Expo Boston in Boston, Mass. The cast also signed autographs and participated in a panel to talk about the beloved franchise. “Wow. This just happened,” Tom captioned their picture together. “Four old friends get back from the future,” Lea wrote on her Instagram. “Back in 2018, even Biff made it,” said Michael. See the reunion pic below! Michael J. Fox is recovering after an operation on his spine. The 56-year-old recently underwent surgery but is recovering and doing well. “Michael J. Fox recently underwent spinal surgery unrelated to his Parkinson’s,” his rep said in a statement to People. No further details about his surgery have been revealed but it is likely the reason he was recently forced to cancel an appearance at the Calgary Comic and Entertainment Expo later this month. We hope Michael makes a quick recovery! Ansel Elgort Sings National Anthem at Knicks Game with Lots of Celebs in Attendance! Lots of celebrities hit up the New York Knicks game last night! Lindsay Lohan was seen hanging out with her brother Dakota on Saturday (December 16) at the Madison Square Garden Game between the Knicks and the Oklahoma City Thunder. Also seen in the crowd were Emily Ratajkowski with a mystery guy, Ansel Elgort, Michael J. Fox, Chris Rock, and more. Ansel sang the National Anthem at the game – you can watch below! The home team won the game 111-96 that evening! In addition, Katie Holmes and her 11-year-old daughter Suri were seen at the basketball game sitting courtside together. Kristen Stewart looked cute in a crop top at the 2017 Museum of Modern Art Film Benefit: A Tribute to Julianne Moore! The 27-year-old Personal Shopper actress paired the white top with black and white patterned pants and a matching jacket at the event held at the Museum of Modern Art on Monday (November 13) in New York City. Kristen snapped this pic with star of the night Julianne Moore as well as Elizabeth Banks. Julianne dazzled in a black and silver strapless dress and diamond jewelry, and Elizabeth looked chic in head-to-toe white. Julianne‘s husband Bart Freundlich, their 15-year-old daughter Liv, Christy Turlington, Jerry Seinfield, his wife Jessica, Michael J. Fox, his wife Tracy Pollan, Phoebe Tonkin, and Rachel Roy also stepped out to show their support. FYI: Kristen is wearing Chanel. Elizabeth is wearing Emanuel Ungaro. Julianne is wearing Chanel. Phoebe is wearing Chanel. The event was presented by Chanel.